My dad is not a beer expert by any stretch of the imagination. He doesn't even know what an IPA is. 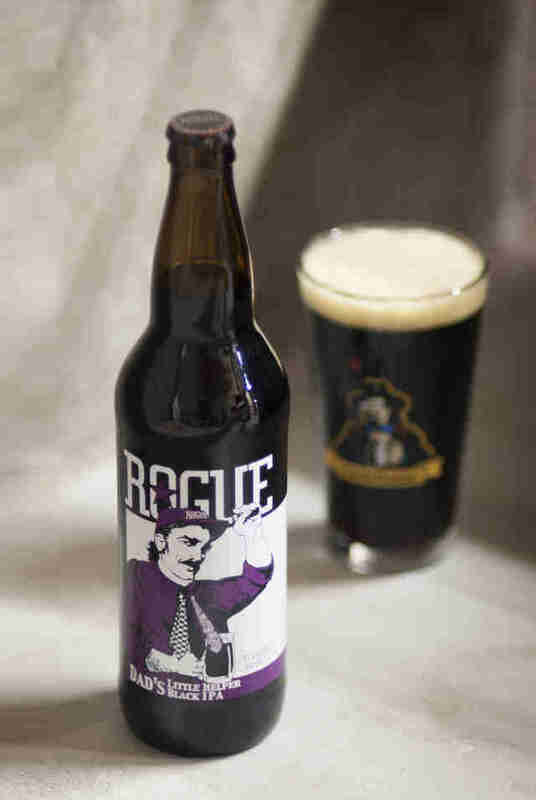 But because Rogue Ales' Dad's Little Helper Black IPA is "dedicated to dads", I felt he was the most appropriate candidate to review this beer for us. Here are his findings. "Black eye-pa?" I explained to him that it's pronounced I-P-A and that it stands for India Pale Ale. Sure, I can't understand Bernoulli's Equation like my dad can, but at least I can pronounce IPA. Who's the sucker for becoming a beer writer now, dad?! The label design "I like the label. The picture appeals to a professional and a non-professional at the same time -- the guy has a tie, yet he's wearing a hat. He's dressed like a professional and a non-professional in the same picture." "This is my bottle. This is my asset. Don't touch it." Dad's Little Helper comes in bombers. My dad is not used to drinking bombers. 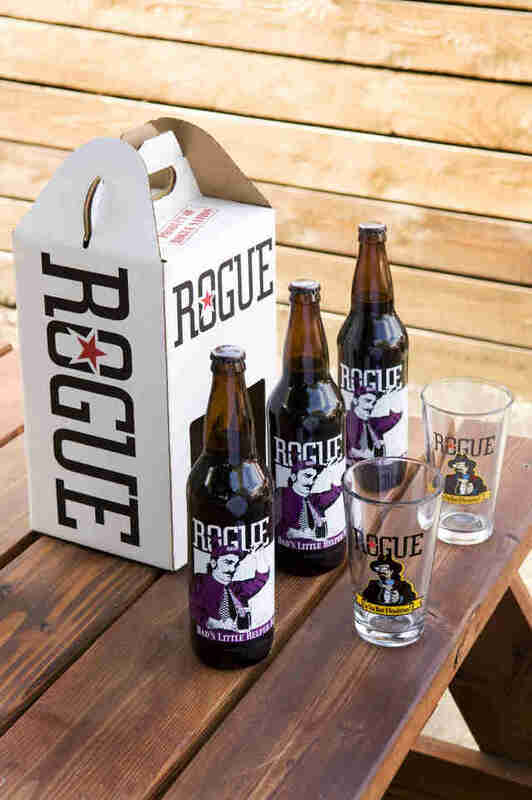 His favorite beers are Heineken and Honey Brown Lager. He's a generous person. The man has never made a sandwich in his life without cutting off half of it to share with whoever happens to be in the kitchen at the time. Apparently his generosity is limited to sandwiches. The pour "Can I pour it in a coffee mug?" he asks. "No," I reply. "Only a beer glass." So what notes did he pull from the beer? "Black pepper. Like the pepper you put on your eggs." You should know that when I visit my parents, I will grind black pepper onto my eggs. For the record, commenters on Beer Advocate say there are notes of "coffee, chocolate, and grains", though after telling my dad this, he became suspicious of those reviews, and thought they might have "padded" them with unnecessary adjectives. My dad has discovered the secret behind all food criticism. Five minutes later, he made a discovery. "I just noticed two pictures: one of a bull and one of a pig, which makes me think that it's meant to be consumed with steak and pork. So I was right on the money. I didn't even see it before! I was right on the money, I didn't cheat. I honestly gave you my opinion." His excitement was palpable. I think this was his favorite part of the entire taste-test experience. Conclusion Would he recommend the beer to others? To all the dads out there, we salute you. 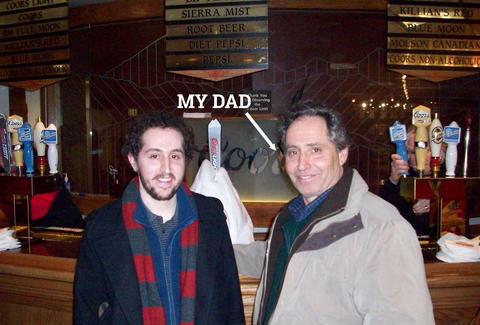 Lee Breslouer writes about food and drink for Thrillist, and thinks everyone should force their dad to drink craft beer. Follow him at @LeeBreslouer, because you can't make up a name that good.